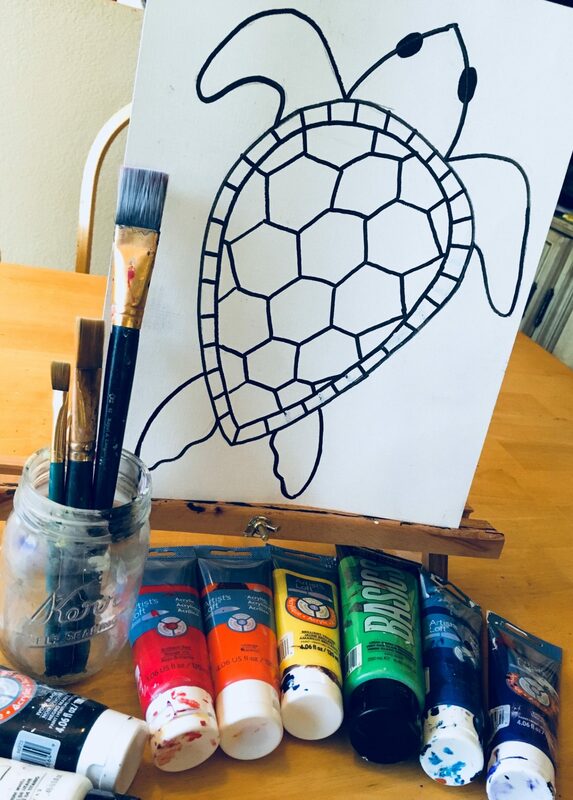 Learn how to paint this adorable sea turtle! I just love ocean themed art and am planning on doing more. It’s probably my favorite subject to paint because it brings back childhood memories of the beaches in Southern California. When I was a child, my family used to go every summer! I have fond memories of walking along the boardwalks and seeing all the coastal art from local artists! I titled this turtle “stylized”. In the art world, that just means that the image is depicted to look almost cartoon-like or unrealistic. This is great for us that don’t like the restriction of realism and want to play around with colors and patterns! I have included in this tutorial, a video and step by step picture directions. There is a traceable template that you are welcome to print out. If you don’t want to print and trace, there are instructions on how to draw the turtle. It’s really quite simple to draw! There are a few advanced steps in this painting. I encourage you to try the hard parts. However, if you mess up don’t worry! The beauty of acrylic paint is that when it dries you can paint over it! I do provide some alternatives in these “hard steps” to simplify your turtle but still make it look stunning! Anyhow, I hope you enjoy painting. I sure had a lot of fun with this one! Don’t forget to share your paintings on the Pinterest Pin or the Facebook Page! Happy Painting Artists! This painting can be simplified in so many ways! Throughout the step by step pictures, I actually provide a few samples on how some hard steps can be made easier. Another tip is to have your child paint on a smaller canvas. Mine was done on 16″ x 20″ but this design can work on any size. Sometimes kids get frustrated when the area is too big to paint. I do provide a traceable too! You can trace the turtle on the canvas, outline it with sharpie and then have your child paint the turtle in like a coloring book. So many ideas! Feel free to contact me if you need some extra tips on adapting this for your child! 16″ x 20″ Canvas or whatever size you prefer! Draw this BIG!! It should fill up almost all the canvas! Draw your turtle lightly with a pencil! Don’t press too hard on the canvas because it will be too hard to erase if you mess up! You also don’t want to puncture or bend the canvas from the pencil. Refer to the step by step drawing guide above. Or transfer your turtle with graphite paper. Also, draw the turtle BIG!! He’s the main subject in this painting so you want him to fill up most the canvas! Paint the background phthalo blue using a 1″ flat brush. Make sure your strokes go all up and down. If you don’t have phthalo blue, use any blue that you’d like! This is very close to a primary blue. Cut in as close as possible to the turtle and then switch to a smaller flat brush to paint the small areas. I used a 3/4″ flat brush to paint as close to the turtle as possible. For this next step, I used a small round brush. Not a tiny one, but a relatively medium size round brush. The wavy lines are all Titanium white! You may have seen it in the video, but alternate the pressure of the brush between light and hard. This will give some indication of water! It works beautifully if your Phthalo blue isn’t completely dry yet! That way the white will blend with the blue a bit to make a beautiful color variation. Next I mixed light green and white. Paint the arms, head and legs with this light green color mix. Paint the rim around the shell. It looks lighter because I actually added a bit more white to this green. Totally not required but I did it to make a distinction between the two shades of green. If you are feeling up to it, do some shading on the arms, legs and head. To do this, I used a dry 3/4″ flat brush and the color “primary red”. Primary red, to me, looks like a dark pink color. So if you don’t have that shade, use dark pink. I “dry brushed” the shading of the primary red over the green. This allows you to see the green underneath. Refer to the video exactly how I did this! This is one of those “hard steps” I mentioned earlier. If you get frustrated, let your turtle legs dry and paint over it with solid green instead. It will still look beautiful! I blended the colors right on the canvas. The center is white and it fades outward to dark red. First paint some white in the center. Then add primary red and blend out. Keep blending colors outward. The next color I used was orange and then dark red. Basically it goes from white to primary red to orange to dark red! Yes, I have a simpler design modification! Refer to the next step! You can also paint the shell one solid color! This is what it would look like. I think it looks great as a solid color! Again, your turtle will still look lovely if you simplify this step! Or, if you like, you can paint the shell any color you want! Use Mars black and a small round brush to paint on the eyes. Use a tiny round brush to paint mars black lines on the rim of the shell. Each line is about a finger width apart. Also note there is a little bit of outlining on the legs. I call this “loosely” outlining. I never like my paintings to look like coloring books but sometimes outlining a little bit allows the image to “pop” some more. Speaking of outlining, next I outlined the entire inside of the rim! I also used black and that same tiny brush. The edges of the shell were painted individually. Those lines are slightly curved. Don’t curve them too much, just slightly! Now, this next step might be something you want to practice on a separate sheet of paper or draw out with chalk first. You will be drawing hexagons. In the video, you will see that each was drawn separately and attached. It’s almost like a soccer ball design on its shell! An alternative would be to just paint some organic shapes on the shell! This looks fine too if you’re struggling with those hexagon shapes. Paint some designs on the shell with that same tiny brush and titanium white. Also note that there are two tiny dots on the turtle’s eyes. Isn’t it magical that two tiny dots on eyes can bring something to life like this? I did some white squiggle lines on the head and legs. This was an added design touch to make the illusion that the water is reflecting on the turtle. Or maybe it’s texture! This is totally optional by the way! For The rim of the shell, I double loaded a 1/4″ flat brush. On one corner of the brush was primary red. The other corner was white. I painted one slightly curved stroke in each of the squares. Do this one stroke “double load” all the way around the rim. So many details in this painting!! You can decide not to do this step if it’s too challenging. The beauty of acrylic paint is that we can always paint over it if we mess up! For the bubbles, I used the same round brush that I used to make the wavy water lines. Paint a circle in a single stroke and add one little arc line on the left of each circle. The color of this starfish is equal parts cadmium orange mixed with titanium white. It makes a pretty coral color. Draw your starfish first with chalk then paint in. Use a tiny brush to stipple on some small dots and do some “loose” outlining around the starfish. I painted a few more bubbles and I was done! What a fun and challenging painting! This makes such a lovely piece to hang in your home year round! Are you proud of your work! I love seeing your paintings on the Facebook page and on Pinterest! I love watching you paint. And I absolutely love the sea turtle.